In mid-February, the weekly HSAC meeting was opened with the icebreaker: What’s your favorite underrated sport to watch? It was a funny, unusual opener. Icebreakers are typically bold predictions for important upcoming games or questions about big upcoming sporting events. That week, however, there really weren’t any big games or events to discuss from the previous week, and there weren’t any major upcoming events to discuss either. We were smack dab in the middle of a lull in sports media: too late to still be talking about the Super Bowl but too early to start predicting March Madness. And that lack of discussable sports material got me thinking. What’s the most boring part of the sports year? Of course, the answer to that question largely depends on your interests. If you’re a football die-hard fan it might be June, after the draft but before preseason hype has time to build up. For baseball fans it’ll be January between the free agent frenzy and the start of Spring Training. So, for the sake of simplicity, let’s just assume you’re the average American (read: “Sorry, soccer.”) sports fan alternating between Baseball, Hockey, Football, and Basketball – the last two at both the professional and the top 25 collegiate levels. Now, armed with this description of the average American sports fan, we can attack the problem. 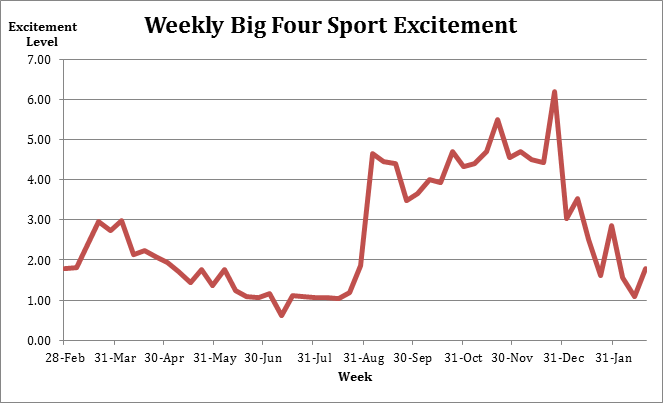 Concentrating solely on games, we could just quantify the most exciting and most boring weeks and months of the sports year by sheer number of games played, but I don’t think that fully captures the rollercoaster that is a modern sports season. After all, Super Bowl XLIX, for all its ups and downs in win probability, was possibly more exciting than an entire month of NBA action can be. I was surprised when I saw all this data together. I fully expected February to be the biggest loser. Instead, the month of February and the week of the icebreaker that started all this did not fare as poorly as expected, it was the summer months that really came out on bottom. 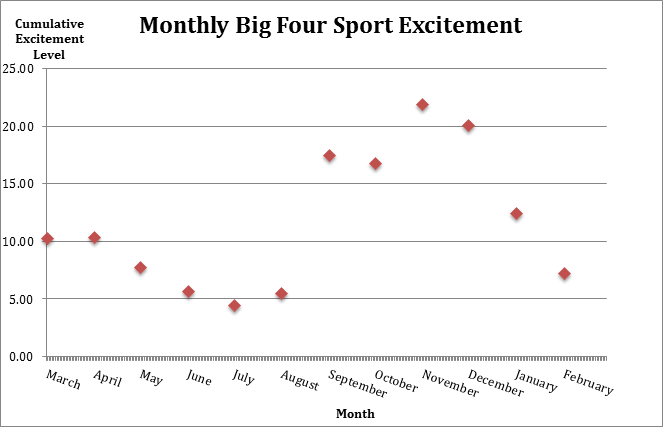 Nine out of the ten most boring weeks of the last year in sports came in June, July or August, and, correspondingly, that trifecta formed the bottom three least exciting months. If you think about it, these results make sense. After the end of the Stanley Cup Playoffs and NBA Finals on June 14th and 15th of last year, respectively, baseball was the only one of the four major sports in play until the NFL started up in early September. In fact, thanks to the MLB All-Star Break, games were played on only four of the seven days of the week of July 12th, our most boring week of the year. 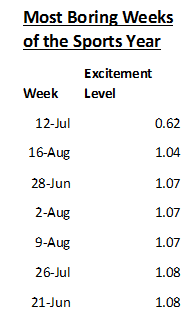 To put July’s dullness into perspective, consider that nine different weeks over the last year scored higher on the Excitement Index than the entire month of July did with a 4.42 rating. The question now becomes, how do we as a sports nation address this problem? It’s obvious that we’ve got to start filling up the summer months with those underrated sports I mentioned earlier. Get an international handball league running in June. Move the golf U.S. Open to the 4th of July weekend. Improve MLS viewership over the summer so as to complement the MLB. Hold the Indy 500 and Daytona 500 on back-to-back days in mid-July. And just for good measure, let’s sprinkle in a few nationally televised beach volleyball tournaments to round out August. This all may sound drastic, sports fans, but it’s the only option we’ve got. It’s either that, or do something in June, July, and August that seems utterly remote right now with the entire Northeast still buried under a Vince Wilfork sized pile of snow – spend some time outside in the warm summer sun working on our tans and our fantasy football mock drafts. Dylan, do you give equal credit to all 4 major sports, or are they naturally weighted by their audience sizes? Do you include college football and basketball, but not the other two collegiate sports? For baseball lovers with multiple games played every day, June-August is a great time to follow MLB. And that even ignores the games (ok, softball) that many can enjoy playing, themselves in the warm summer weather. As a fan of 3 of your 4 sports, I think of February as the dullest month. Can you explain the details on this below? How did you weight and what tv numbers did you use (there’s a lot of games)? With the idea of weighting games based on excitement in mind, I landed on TV viewership as the best indicator of excitement level. I created a fairly simple Excitement Index using average viewership data for each sport’s regular season, playoff rounds, and championship.